March 9, 2016 - Like us now! This is the latest edition of our smartphone buyer guide. 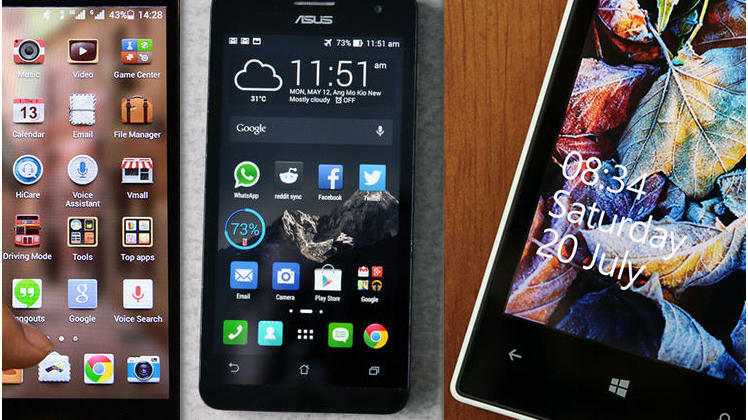 Recently, we listed out the top 5 smartphones under the 10K range. This edition moves higher towards the lower mid-range, higher budget-range smartphones. This is where the competition starts to get tougher. Below are the top 5 phones that you can get within the 20K range.You can also check out latest mobile prices in Pakistan here. 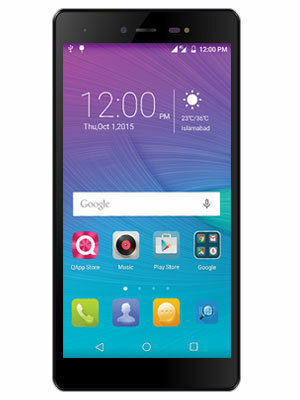 Our Pakistani brand bides quite well in this price range with the QMobile Z10. A 5.2” IPS LCD display with a resolution of 1080 x 1920 pixels is the standout feature of the smartphone. The screen quality is one of the best you will find in this price range and beyond. 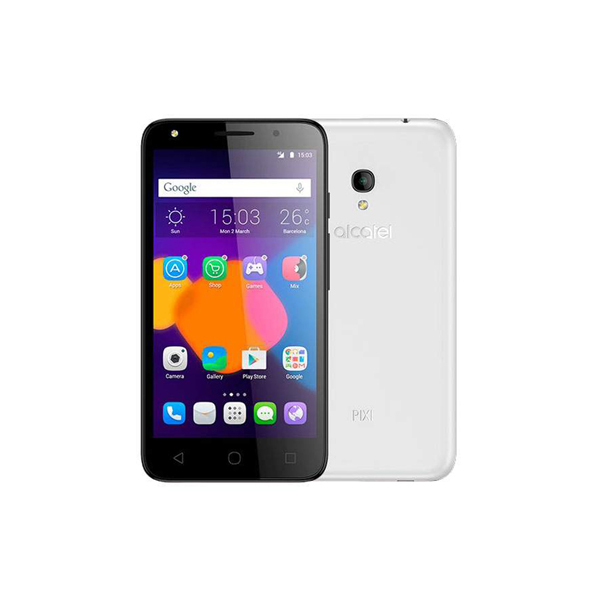 Other than this, the phone has a MediaTek MT6753V chipset and an octa-core Cortex A53 with a whopping 3 GBs of RAM. The 3 GB RAM on the Z10 is one of the highest around – it is more than sufficient for multitasking and extreme workload. You can text, play music, and browse all at the same time without giving a worry about lag. The screen is one of the most brilliant displays around – it not only beats the competition in this price range but does quite well against higher-end phones as well. Comes with Android Lollipop (v5.1) out of the box and also has confirmed support for the latest flavor of Android (the Android Marshmallow). The 16 GB internal storage is sufficient for apps, photos, and videos. The camera performance is average under good light and poor under low light. The QMobile UI is not the most user-friendly interfaces around. The Z10 comes with bloatware out of the back with a lack of a default Android browser – the Guest User option has also been stripped from the phone for some reason (one of the most major changes that came with the Android Lollipop). 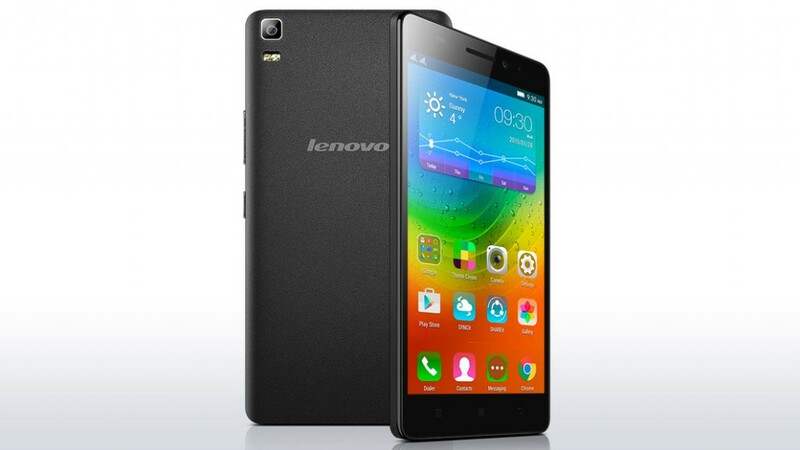 The trimmed down, cheaper version of the Lenovo K3 Note has jolted the budget smartphone arena. The Lenovo A7000 carries with itself all the elements that you would expect from a mid-range smartphone but at a mere price of 18,790/-! Launched last year at the MWC 2015, the A7000 is thin, light, and glamorous. The key specifications of the smartphone include a 5.5” IPS display, the MediaTek MT6752m 64-bit octa-core processor, the Dolby Atmos sound system, and 2 GB of RAM. The major advantage that the Lenovo A7000 has over the K3 Note in Pakistan is the economic feasibility and availability. The Dolby Atmos sound system produces high quality, clear, and loud sound output. The front camera is ideal for selfies and group pictures (especially if you have a large group). The MediaTek octa-core Cortex-A53 chip beats the competition by a huge margin. Not only this, but the processor also performs quite well against higher end phones as well (as shown by the benchmark below). Does brilliantly in providing a gaming experience – the A7000 can handle games like the Asphalt 8 and Real Racing 3 without lag. 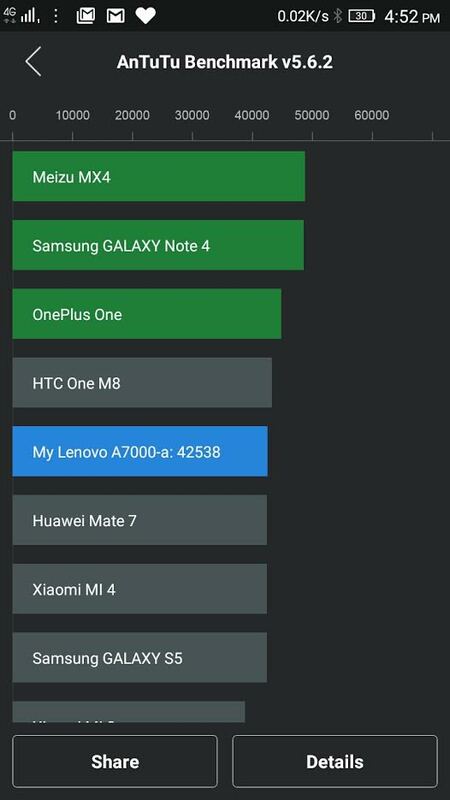 The Lenovo 7000 stands just below the Galaxy Note 4 and OnePlus One in the Antutu benchmark. Lack of availability of protectors, covers, or accessories in Pakistan. The internal storage is limited with no option for a 16 GB model. 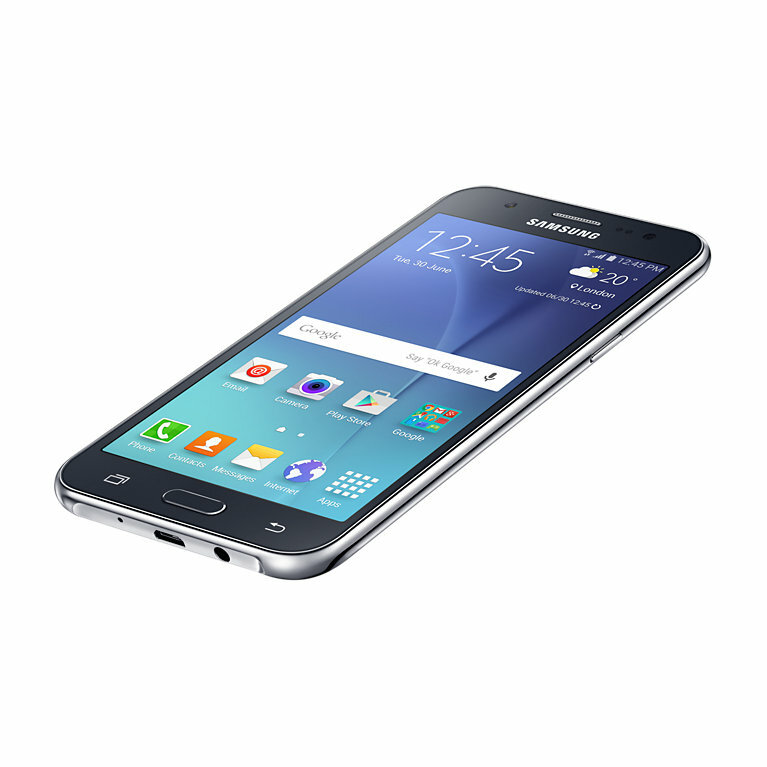 The Samsung Galaxy J5 stays true to the mark that has been set by Samsung’s economical J-series. The phone features an immersive display with the Super AMOLED technology that provides deeper colors and an overall brighter display. The design is perhaps the most notable of all the features of the phone – it’s the traditional Samsung rectangular design with the rounded corners. Overall, the phone is elegant, slim, and simply beautiful. Coming on to the specifications of the phone, it has a 5.0” display with the powerful Qualcomm MSM8916. Apart from this, the J5 also features a wonderful combination of a 13 MP back and 5 MP front shooter that handle the job well. The Super AMOLED display is a rarity in this price group. The screen enables it to be viewed from a variety of different viewing angles – it also does a fairly excellent job under the direct sun. Elegant design that feels wonderful in the hands. Samsung’s TouchWiz wins over other user interfaces in this price range particularly because it provides powerful functionality without eating up much memory and performance. Both the back and front camera produce particularly high quality output that is ideal for this price range. 1.5 GB of RAM is below average especially when you consider the competition. 8 GB of internal storage with Android Lollipop and TouchWiz is simply not enough. The phone only comes with a mere 4 GB out of the box (allowing for the UI and Operating System) which is simply not enough. Huawei, the Chinese company, never disappoints in terms of power and performance. The Honor 4c was launched in April 2015 and it still continues to be one of the best smartphones in this budget range. The HiSilicon Kirin 620 is one of a kind that stands apart from the Qualcomm and MediaTek chips that are widely available in the market today. 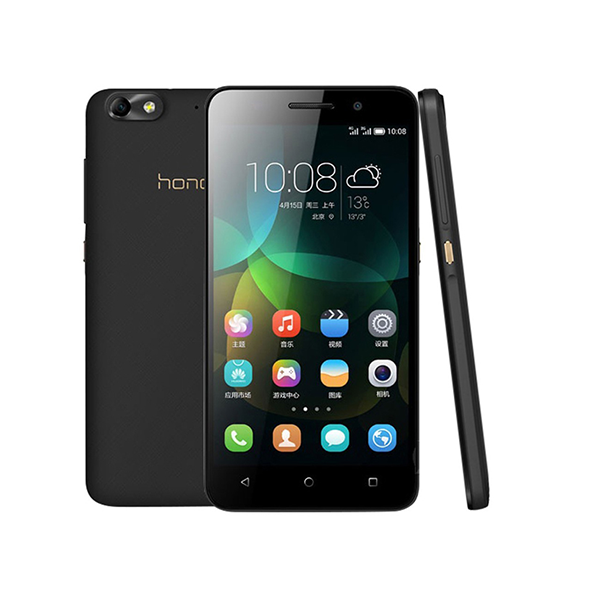 The power packed performance of the Huaweri Honor 4C is worth the money. Huawei Honor 4C also has great support for updates – It was launched with the Android KitKat (v.4.4) but it has support to up to Android Marshmallow at least (as announced by Huawei). The camera results are quite good for the 13 MP back shooter. The 5 MP front camera also does well in good lighting. Emotion UI 3.0 is a minimalistic UI that does not hog up memory or processor power (almost no bloatware or additional software installed at time of first start). Good battery time – The Huawei Honor 4C has an IPS LCD 5.0” display accompanied with a 2550 mAh battery which allows the phone to give brilliant battery time even under moderate use. The smartphone is much heavier than most of its counterparts. Even though the design is wonderfully ergonomic (feels great in the hands), the screen to body ratio is poor (only 66.9%). 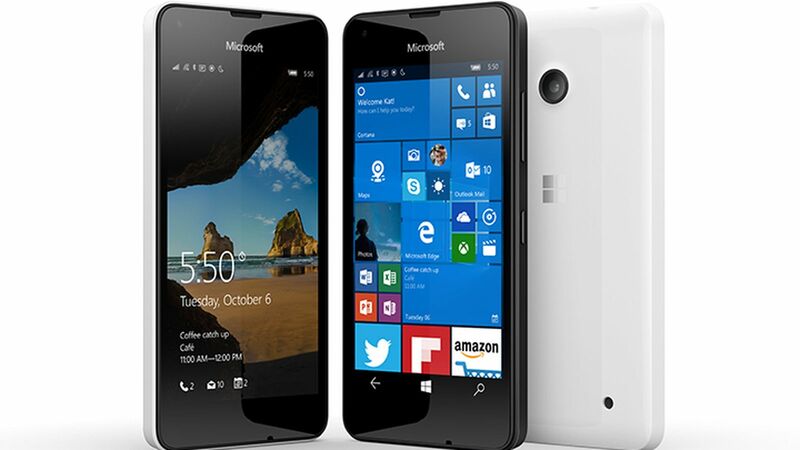 The necessary Windows phone for the price group is the Lumia 550. Released in October 2015, the Lumia 550 comes with the latest Windows 10 out of the box. This is accompanied with a Quad-core Cortex A7 processor that performs quite well even under pressure. The 4.7” screen size is somewhat a newer experiment by Microsoft (considering that they’ve either done 4” or 5” phones in this range). This experiment however, in our opinion, works well because the phone is easy to hold and use with both hands as well as one hand. The RAM is on the lower side though, even despite Microsoft’s efficient memory management, 1 GB is below par in this price range. The most powerful and up-to-date Windows phone in this price range. The quad-core processor does very well in handling most tasks under the Windows environment. Windows 10 out of the box – get the taste and feel of the latest Windows mobile with the Lumia 550. The phone is quite thick especially when compared with the competition available. The 1 GB RAM simply does not suffice for multimedia tasks. The camera is below par in terms of both quality and resolution.